Description: Perennial; stems several from woody crown, 2-5 dm tall, usually freely branching, puberulent and glandular, at least in inflorescence; basal leaves puberulent, oblanceolate, (5)10-18 cm long, 1-2 cm wide, attenuate to long petioles; cauline leaves 1-3 pairs below the first inflorescence branches, oblanceolate and petiolate or lanceolate and sessile, 5-15 cm long, 1-2 cm wide; inflorescence loose and elongate; cymes terminal as well as at ends of numerous lateral branches; pedicels 1-3 cm long, glandular-puberulent; calyx tubular, 8-11 mm long, glandular-puberulent, 10 prominent greenish nerves often sinuous, lobes narrowly acute, 1/3 as long as tube; corolla greenish-white; petals densely ciliate below but not ciliate above, claws 7-10 mm long, auricles rather prominent, blades about 3 mm long, bilobed 1/3-1/2 their length, the lobes with a small lateral tooth at about the level of the sinus, appendages small, 0.3-1 mm long, pilose-lanate; stamens exserted about 1 mm; styles 3, equaling stamens; fruit a capsule. Flowers mid-August to early October. Similar Species: Silene thurberi is most likely to be confused with S. scouleri ssp. pringlei, which is more or less sympatric. 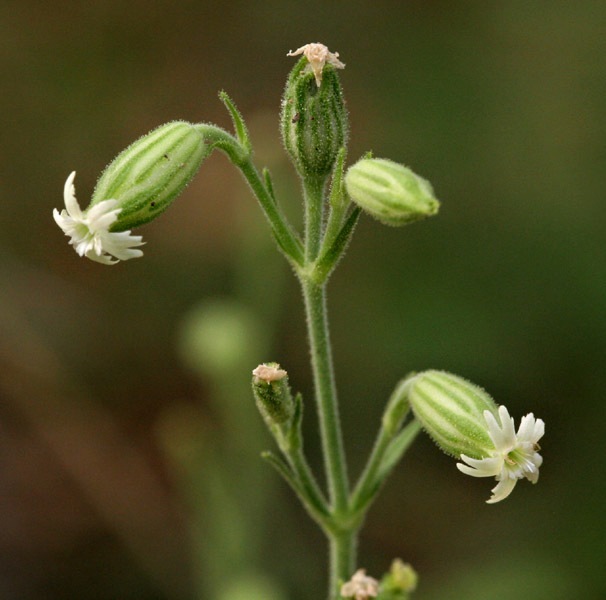 Silene scouleri ssp. pringlei has a usually simple inflorescence, smaller leaves, and longer calyx (8)10-18 mm long. Also, in some ways, S. thurberi is similar to S. menziesii var. menziesii since both have small calyces and petals, but S. menziesii var. menziesii is smaller in most other vegetative respects, is rhizomatous, and grows in the Rocky Mountains. Distribution: New Mexico, eastern Grant, western Sierra and Hidalgo counties; Arizona, Cochise County; adjacent Mexico, Chihuahua and Sonora. Habitat: In protected locations on rocky areas and slopes; in arroyos and mountains; elevational range not documented, but perhaps 1,520-2,130 m (5,000-7,000 ft). Remarks: This plant is seldom collected. Most specimens, at least at the University of Arizona, were collected between 1885 and 1941, and five of seven are from Mexico. Nevertheless, three collections (at New Mexico State University) from the Peloncillo Mountains, Hidalgo County, New Mexico, were made in 1979. Conservation Considerations: Additional field surveys are needed to determine the abundance, distribution, and habitat requirements of this plant.